LG has crafted a pretty compelling tablet-notebook combo, fittingly called Tab-Book, with a sliding keyboard mechanism, which is aimed to bridge the gap between slates and laptops. Equipped with a touchscreen of undisclosed size, it is also powered by a respectable Core i5 processor to run that Windows 8 full speed. The Tab-Book is going to appeal to consumers who want the convenience of a tablet but also the productivity of a notebook and don’t want to carry two devices all the time. Many other products that claim to do both require making too many sacrifices in performance and weight. We think we’ve hit the perfect balance here and with super fast LTE connectivity, we’re delivering true convergence of computing and mobile devices. No other specs like battery life or price are disclosed in the press release, but LG says we will have a chance to peruse it at the MWC Expo in just a few days, and after the launch in Korea this week, it will later be rolled out in "additional markets". A competitor to the Surface Pro arrives! Asus already made a keyboard almost identical to this. I'm not knocking LG for copying, just glad to see other OEMs working in this direction. @MWC SOMEONE better have a 7inch Pro or RT tablet. After looking at this on youtube, it seems the "undisclosed" screen size is 11.6 inches. 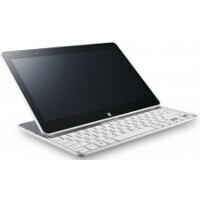 What Lg did is just copy Sony Vaio Duo 13 and Apple. Please Vaio and Apple bring big charge from Lg. This is so rude.They dont even give a respect.